An archive is a file containing one or more files along with their data. You use archives in Windows 10 to collect multiple files into a single file for easier portability and storage, or simply to compress files to use less storage space. Archives are also useful when you want to send multiple files to someone by email. Instead of attaching several large files, archive them into one file. That file takes less space than sending all the files separately, and it’s easier to attach and send by email. Select the files and folders that you want to archive. Click the Share tab on the Ribbon. The Share tab is displayed. In the Send section, click the Zip button. An archive is automatically created in the same folder as the files and folders that you selected. You can edit the name of the archive. Type the name that you want for the archive file. Press Enter or click somewhere else in the File Explorer window. You can now use the newly created .zip archive and send it by email or store it where you want on your computer. 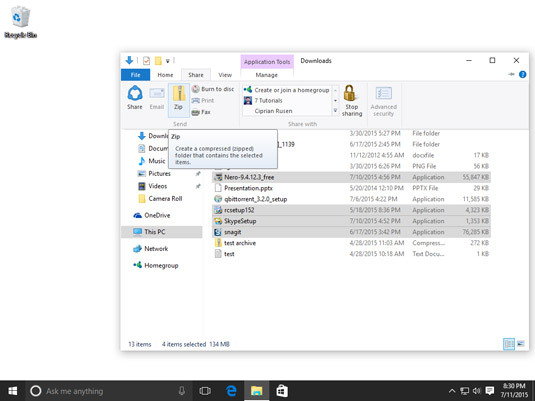 The Zip button in File Explorer. If you want to save space on your hard disk, it’s a good idea to delete the files and folders that you placed in an archive, as you can always extract them from the archive.